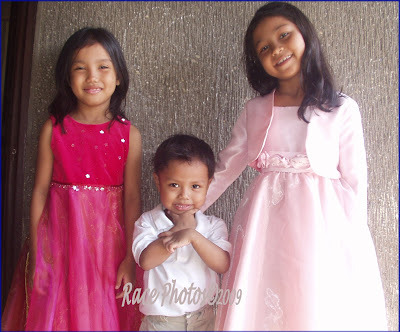 Nice to be back here in photohunt, my entry for this week is my kids' photo 3 years ago when we're about to go to our church. I remember making my girls wear their dresses given by their auntie from G.B. and I liked how the colors fit them well, red for Genesis and pink for Ruth well my youngest wouldn't be upstaged by the two so he just put a 'pogi' sign in his chin. By the way for non-Pinoys 'pogi' means handsome or cute! awww...so pretty in pink. great photo for today. I'm up too. Pink really does look good on them. They look so cute. Love the pastel pink on her.